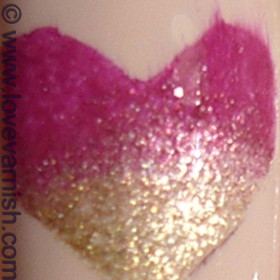 Love Varnish: 31 Day Nail Art Challenge - Gradient Nails! 31 Day Nail Art Challenge - Gradient Nails! Hi loves! How are you today? I had quite a hectic day and this afternoon I had to go to the dentist for some cleaning. It hurt a bit but now I have extreme clean teeth haha. Today is all about gradients and I have done them quite a few times already. So, I am taking a bit of a detour here and will not be showing a traditional gradient. Or not as a full manicure at least. I've seen some heart shaped nailart around and I wanted to try this "cut out" look for myself. Here's what I did on each nail. Thumb - 2 coats of $OPI XOX Betsey, gradient with Manhattan 65K. Index - 2 coats of Manhattan 65K topped with 1 coat of $OPI Traffic Stopper Copper. Middle - 2 coats of $OPI XOX Betsey. Ring - 2 coats of $OPI XOX Betsey, gradient heart with Manhattan 65K & China Glaze 2030. Pinky - 2 coats of Manhattan 65K dotted with China Glaze 2030. The heart shaped gradient isn't too hard, it just takes some patience and preparation. You take a piece of tape. First, fold the ends so you have a little non-sticky part. Fold together the tape. Cut out half a heart (the center being the foldline). Unfold the tape by pulling on your non-sticky flaps. 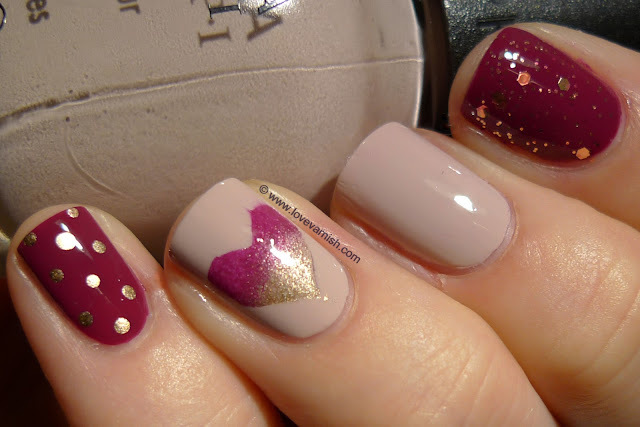 Place the heart on your nail. 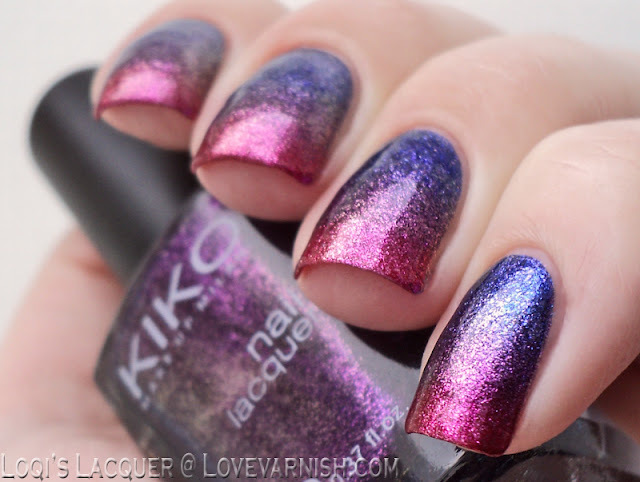 Do your gradient (or just use one polish!) and remove the tape. Topcoat, and done! I quite liked the look of this and I hope you do too! Let me know what you think of it (and if a tutorial would be helpful?). 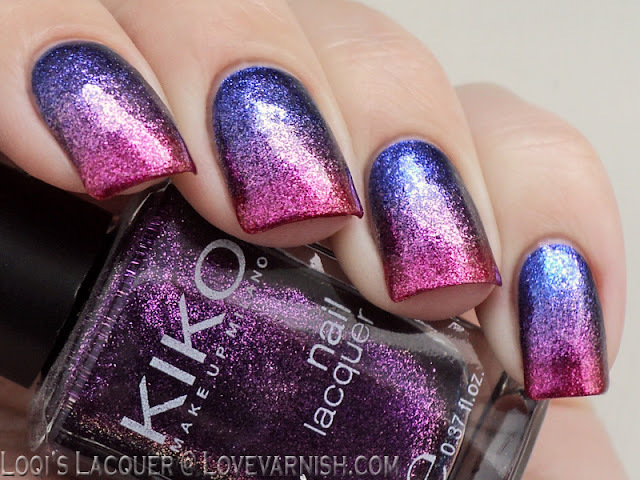 These were the polishes I picked: Orly Lunar eclipse (blue), Kiko 278 Violet orchid microglitter (purple) and Kiko 277 Blueberry glitter (pink) (the Kiko polishes are both called glitter, but they are really not glitters at all). I used the technique where you paint the polish directly onto a make-up sponge and dab it on your nails. Now I just need a party to wear this to! Stay tuned for challenge day 11: Polka dot nails! 31 Day Nail Art Challenge - Rainbow Nails! 31 Day Nail Art Challenge - Metallic Nails! 31 Day Nail Art Challenge - Black and White Nails! 31 Day Nail Art Challenge - Violet Nails! 31 Day Nail Art Challenge - Blue Nails! 31 Day Nail Art Challenge - Green Nails! 31 Day Nail Art Challenge - Yellow Nails! 31 Day Nail Art Challenge - Orange Nails! 31 Day Nail Art Challenge - Red Nails! OMG I love both but I simply adore Loqi's one and I totally have to re-create it! That gradient is probably the best one I have ever seen. I love it!!! I love both of these so much! 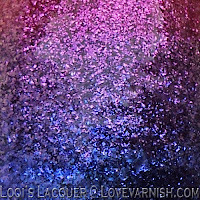 The heart is so adorable and the colors for Loqi's are so vibrant and eye catching! Both of the looks are stunning! and I so need to try the cut out! Thanks so much! Let me know when you've re-created it! Thanks Angie! Using all glass flecks almost makes the gradient create itself, I love it! Thank you very much! Please show us when you've done the cutout! Thanks Simona! 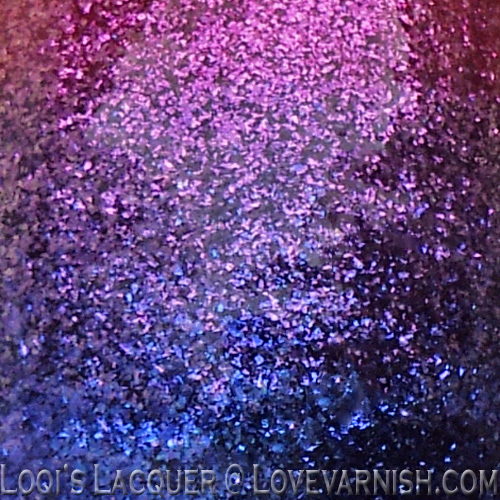 And yes, Loqi's mani is just.. *swoons* PERFECT! I can't wait to see your results :D.
Thanks so much! Welcome and enjoy! That gradient heart technique...I must try it out! I do really love the final result!